This is Diwali , Rangoli Kolam. I pray to Sri.Laxmi Narayan to bless us all, happy , prosperous & peaceful life on this happy occasion. Very colorful rangoli, like ur family members.I pray for your unique & talented family to continue. Diwali wishers to ur entire family & to our blog. Thank you Sankar saranya.I take this greetings as coming from the sidhars from Pondichery area.My namaskar to your parents,best wishes to your family & children. 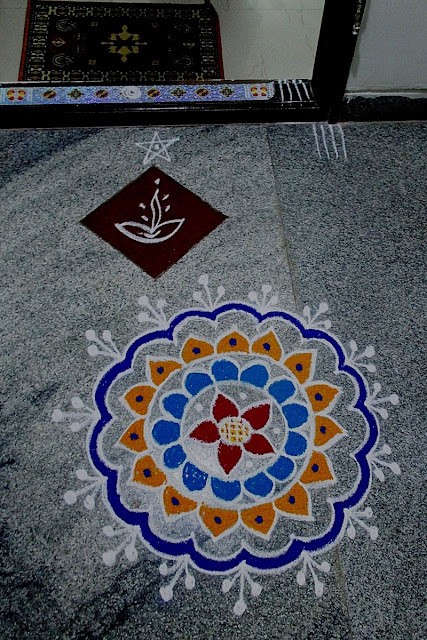 Festival kolam Rangoli (Karthigai Deepam). Free hand Rangoli / Kolam. Diwali Kolam / Rangoli Designs.